Within the past week, Eisley has started this thing where I'm rarely able to do anything on my own for longer than a couple minutes. She always has something she wants to show me. Whether it's her favorite part of a TV show or something she found in her toy basket, she will run over and say, "Mommy! 'mere mommy! Look!" She will grab by pant leg or my hand and drag me throughout the house to whatever it is she is excited about. Maybe at some point I'll be bothered by it, but for now I find it completely and utterly adorable. I was coloring with her this morning before her nap, and when I finished coloring a small part of the page she clapped her hands and exclaimed, "Yaaaay, mommy, yaaay! Job-job!" It's the first time I've heard her say (her version of) "good job" and it made me laugh. She'll also compliment my outfits here and there, saying, "Pretty green shirt!" or, "Ooooh, dress! Niiiice." The girl has no fear when it comes to climbing, tumbling, balancing, jumping off things, or leaping into swimming pools. It's odd to notice things about her that are completely opposite of my own personality—and I have a feeling she'll be a bit more adventurous than I am. (But, of course, only time will tell.) We've taken her to pools a few times in the past month and she will stand on the edge, give me (or Jay) this mischievous side-eye, then do a total trust-fall straight into the water. Terrifying, yet impressive. I'm pretty sure we'll be putting her in swimming lessons and gymnastics classes sometime down the road. Whenever we go to leave somewhere, Eisley will yell out in this piercing voice, "Bye, [insert object]! Later!" She will do this with anything from her booster chair at the kitchen table to her favorite pair of flip-flops. Most times she will also offer the item a kiss, as well. She still enjoys intense retellings of anything that has happened in the past few weeks. She'll overhear conversations and repeat key phrases, acting like she is fully a part of whatever is going on. I love that she is now able to sing along to songs! Not perfectly, but her renditions are even better, in my (completely biased) opinion. When she wakes up in the morning, the very first thing she says is, "Life cee-lo?" (She's legitimately obsessed with Life cereal.) This happens literally every morning. Give the girl a bowl of cereal, and she will love you forever. To beat the heat this past week, we've been spending a lot of time at the mall. (Yes, I am that mom.) Eisley impressed me so much yesterday, though, because it was the first time I let her walk into stores without holding my hand. I would remind her she could look, but that we weren't going to buy anything. I could tell she felt very grown up, walking around the stores and looking at all the toys and clothes. She didn't once throw a fit, and it blew me away. I'm not under any illusion of this lasting forever, but I was pretty darn proud that at her age she was able to obey so well and not throw any sort of wild tantrum when we had to leave the Disney Store without a pair of sparkly Rapunzel shoes. 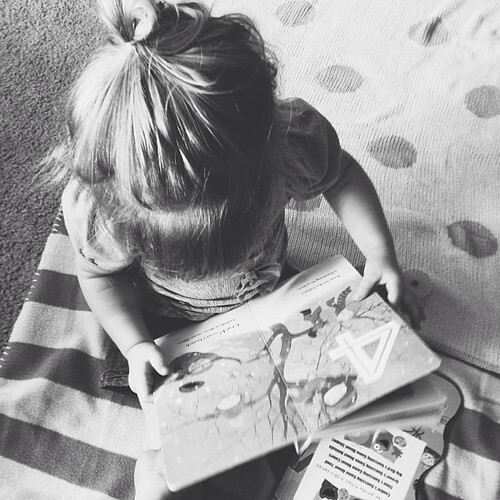 She loves books, the library, Toy Story, shoes (both hers and mine), Annie's fruit snacks, coloring books and crayons, Caillou, sweeping with her Eisley-size broom, the beach, playing with her dollhouse, and being anywhere new. I'm grateful for her politeness—she will tell me sorry if she did something bad, she says thank-you ("day-doo") and you're welcome ("welcome") and excuse me ("ah-mee") and please. I'm grateful for her sense of adventure and her enthusiasm for anything and everything. I'm grateful for her eagerness to learn. So far, age two is pretty darn awesome. And I'm excited to see what else this year has in store for us! Hah, I don't think the disclaimer is strictly necessary, but it's always nice to keep it real. I miss you and the little Miss. I can't wrap my head around the fact that she is TWO. Seriously, when did this happen. So adorable. I love when kids talk to objects and make their own versions of phrases.